Original STAR TREK The Motion Picture U. Enterprise Mylar Poster, 28-1/4" x 22", Sales Corp. Of America, San Francisco, CA (1979). Condition: Fine, unhung, light scratches on back/front which seems to be typical for this poster, overall looks beautiful, (no tears, no tape, no pinholes), very clean and sharp. We use a general grading scale as follows. We note details on posters with specific issues. We do not use stock photos; the poster you see in the photo is the actual poster you will receive. The item "ORIGINAL STAR TREK THE MOTION PICTURE U. 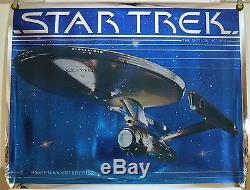 ENTERPRISE MYLAR POSTER (1979)" is in sale since Thursday, March 2, 2017. This item is in the category "Collectibles\Science Fiction & Horror\Star Trek\Movies". The seller is "primo_source" and is located in Portland, Oregon. This item can be shipped worldwide.